As one of the many services we offer, we’ve noticed at aeration and compost is one of the most misunderstood. Often, many of our customers don’t even know what these two services are or how they can help their properties. Luckily, we’re here to help educate our clients on all the benefits of good landscaping tactics. To start, aeration simply means creating room for air to be circulated throughout your soil. After a while, soil becomes compact—which makes sense with people, gravity, and plants all pushing down on it. When it becomes compact, it becomes difficult for the soil to release its nutrients to the surrounding plant life. Unfortunately, this is never good because plants need the nutrients from soil to survive. So, how to we combat this problem? Aeration and composting! When preparing the area for aeration and compost, we follow some simple steps, which includes removing the small cores, thatch, loosen up the soil to allow water and nutrients to be evenly distributed deeper. This process ensures that all flowers, shrubs or any vegetation that will be planted there allows roots to grow deeper which end results is an attractive outdoor that you would have been dreaming about. It also helps to de-compact all that soil and loosen it back up so it is similar to the state it was in when it was first laid on your landscape. We know that quality soil is not cheap, so the ability to maintain and reuse it as much as possible is something that all our customers love to hear—and thankfully, aeration and compost can help us do that. 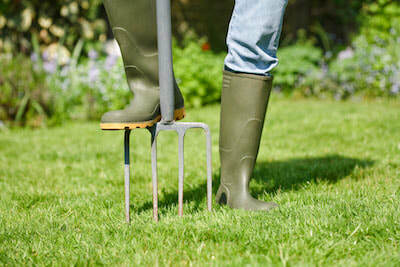 Additionally, if your lawn is dry and having problems, we will double aerate and add compost to help jump start it. If the lawn is thin and not looking great, talk to us about doing a lawn renovation and over seeding to bring it back thicker and better than ever. Whatever it is your lawn may need, we can help provide the tools and knowledge necessary for proper lawn maintenance all year round. 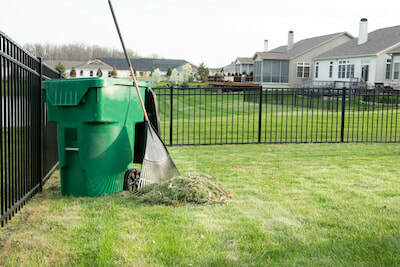 ​Now, composting is a little different than aeration. While aeration is focused on breaking up the soil, compost is thought to recycle nature’s natural materials so they can be used again throughout your soil and landscape. We know, this may sound a little confusing but bear with us. Think of compost as another form of soil. Instead of purchasing soil at the store, you are creating compost at home in a natural way. Then, this compost can be mixed in with your soil to provide additional nutrients. While we do sell some forms of commercially engineered compost materials, we always recommend composting at home. It’s not only more economical, but it’s better for the environment. If you’re interested in scheduling aeration for your lawn, be sure to reach out to our staff. Likewise, if you’d like to learn more about how to begin composting at your home or commercial property, feel free to set up a consultation with our team so we can walk you through the entire process step by step. We’re here to make your landscape flourish and expand your general knowledge on the best tips and tricks of the trade.